Jeep has a new Compass model which looks good and drives well. Having the AWD power to take you plenty of out-of-the-way places, I can see this Jeep being popular with the urban adventurer. With plenty of scope to take the family on a decent holiday, the new Jeep Compass offers good room in the rear. While not a seven-seater or being a large SUV, the room in the second row is first-rate for long journeys. Jeep actually places the Compass in what would be classed as the small cross-over sector. So it’s not a large SUV. Competing against Honda’s CR-V, Suzuki’s Vitara and Nissan’s Dualis, the Compass does a great job. 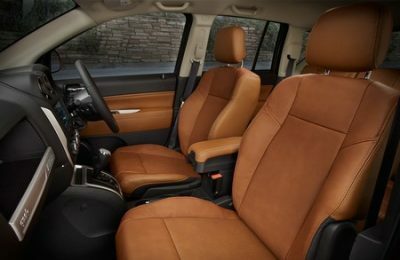 If you happen to be a back seat passenger, then there is comfortable space, seating and features like your very own air vents, a USB port, and an auxiliary outlet on the back of the centre console. Throw the luggage into the sizeable loading space, and you’ll be surprised at how much you’ll get inside – though you will need to get the luggage up and over a sizeable lip. A handy optional extra, that doesn’t cost a whole lot of money, is the luggage barrier – enabling you to stack the luggage right up to the Jeep Compass’s roof. With this feature, you can also carry man’s best four-legged friend without any concern of him/her jumping out of the luggage compartment and onto the rear seats. An excursion usually involves a decision on where-abouts on Google maps you want to go. Sometimes the quirky place names or special landscape features just need to be explored, and that is what the Jeep Compass is all about. 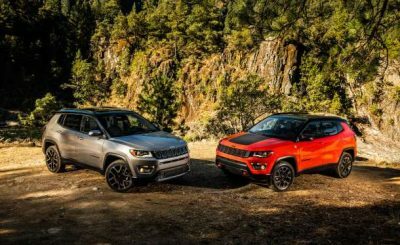 With a fully equipped Trailhawk model available, the Jeep Compass becomes a potent little off-roader with over 21 cm of ground clearance, skid plates, and a crawl mode that locks the transmission in first gear. Via the Selec-Terrain knob that governs the all-wheel-drive system, you can select between Rock, Snow, Sand, Mud, and Auto modes. The Trailhawk also has buttons for 4WD Low (the crawl mode), 4WD Lock, and hill-descent control. If you’re not so keen on the off-road side of things, then the standard Jeep Compass comes with FWD and a high ride. Any of the new Jeep Compass models offer well-weighted steering which is nice and accurate around town and on the open road. All models come with the 2.4-liter inline-four cylinder petrol-fed engine. Six-speed manual gearboxes, six-speed auto and nine-speed autos are available. Stout power delivery with a relaxed driving feel is what the Jeep Compass driving experience is about. If you want a performance drive, then you’ll need to look to the larger Grand Cherokee models for that. Every day performance is fine in the Compass, and there is enough grunt there to do most of what you’ll need. The new Jeep Compass is fairly hefty, but this weight is well sorted on the road and even adds to the solid feel plus composure you experience on-and-off the road. As far as appearance goes, the Jeep Compass is one of the better looking small cross-over/SUV vehicles. Chunky styling is well-rounded and rugged, while there is very little front and rear overhang. Designers have done well with the wide spaced chrome-rimmed grille which is bold and very much a centre piece of the new Jeep Compass’s front end. Even a base model Jeep Compass is kitted out well with a very good infotainment system and optional Apple CarPlay and Android Auto features available. Up front, the dash has a large 8.4-inch touchscreen that looks good with clear graphics. The Jeep Compass has a a smart cabin, and the styling of the instrument panel is nice. The black interior is smart, though the Trailhawk gets some cooler looking leather-and-cloth seats with red stitching. 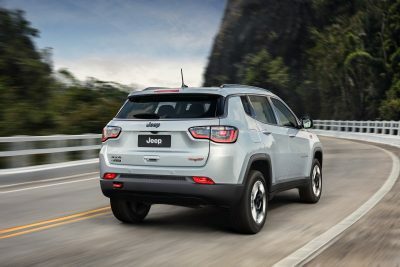 Other features that Jeep Compass vehicles provide are a power boot/gate, parking sensors, rain-sensing wipers, a security system, blind-spot warning, a heated steering wheel (optional), heated windshield (optional), and heated front seats (optional). A panoramic sunroof is also available. Take a new look on your drive home and experience the way Jeep can take you to all points of the compass. For any more information on the 2017 Jeep Compass or, for that matter, any other new car, contact one of our friendly consultants on 1300 303 181. If you’d like some fleet discount pricing (yes even for private buyers! ), we can submit vehicle quote requests out to our national network of Jeep dealers and come back with pricing within 24 hours. Private Fleet – car buying made easy!